Last month we looked at an entry level NAS device from Synology which offered a great entry point into having home or small office network storage capability. Today in our Synology DS415+ Review we go high specification with a NAS device that offers pretty much everything mainstream and enthusiast users as well as many small-medium businesses will need. Synology package the DS415+ in a professional looking box which covers some of the key features of the device. Inside we find a couple of network cables, a 120w PSU, screws to install drives, a mains plug and a quickstart guide. The DS415+ is a fairly chunky NAS, though not as big as a mini-ITX based PC, and measures 165x203x233.2mm weighing 2.05KG. The majority of the casing is matt black plastic which surrounds a metal frame and our front surface is a glossy panel. Down the right side we find a number of status LEDs above our power button and that sits beside a USB 2.0 port. What do we have inside? The key components are a quad core Intel Atom running at 2.4GHz with floating point and hardware encryption engine to maximise performance. Our memory is 2GB of DDR3. Flipping the DS415+ over we can see some ventilation holes for airflow and the four rubber feet which help the NAS stay stable on our desk/surface. Looking at the back of the device we have a power input (the 415+ uses 46.2w when accessing and 17.3w in HDD hibernation), 2x USB 3.0 ports (inc. Wireless support), dual GB LAN ports (Link aggregation/Wake on), 1x eSATA, Kensington lock slot and 2x 92mm cooling fans. They give the NAS a decibel rating of 20.2dB(A). Installation (and removal) of drives in the DS415+ is a very quick and simple process. We pull off the front surface then push up a clip and slide out the drive tray. 2.5″ and 3.5″ devices are supported, including SSD read/write cache along with TRIM and we have full support for RAID 0 to 10 as well as JBOD and Synology Hybrid RAID which allows us to mix drive types/capacities. Synology also offer support for the latest 6TB drives. For more advanced storage needs we also get a max file system size of 108TB, 512 internal volumes, iSCSI Target number of 32 and max iSCSI LUN of 256 (with clone/snapshot and Windows ODX). To install a drive we simply screw it into the tray using the bundled screws and then slide the caddy back into the NAS. For those looking to install the 415+ in an environment with a large number of users the max user account setting is 2048 with 256 groups supported. There is a max shared folder setting of 512 with sync tasks set to 8. We can also have 512 concurrent CIFS/AFP/FTP connections and the NAS supports Windows Access Control (ACL) integration along with NFS Kerberos authentication. For virtulisation the DS415+ is certified for Windows Server 2012 and 2012 R2 with VMware vSphere 5 (with VAAI) and is Citrix Ready. As with all Synology NAS devices, the setup process on the DS415+ is quick and simple. They all run the same process which we start by launching the DiskStation Assistant which quickly and easily sends us to the web interface for our NAS. In here we get a quick summary of the unit before selecting the OS install file from the web, or locally. Next up we choose our main username and password and then it is on to the automated portion of the install. It takes less than 10minutes to install DiskStation Manager and get to the login screen which gives us a quick summary of the time and local weather. The final step is to set up our remote access ID and then we are into the main OS. As with the other Synology NAS devices, once installation and setup is complete we land on the home screen. This is in effect the ‘desktop’ and has a familiar Windows/Linux like UI experience which features taskbar, icons/shortcuts and a main menu (start) button. On the desktop are the default icons which include File Station, Control Panel and Package Centre. Along the top taskbar we have a ‘start’ button on the left and over on the right, a search function, user account menu, display options as well as a notification system and (when appropriate) an icon informing us that there is a USB device currently connected. In the bottom right corner we have our quick access status indicators. Here we can see over health status of the system, the current CPU/memory usage as well as bandwidth use. The start button, situated top left opens a menu with pretty much access to all the features of the NAS. This includes any additional apps installed via the Package Centre. The Package Center, is Synology’s ‘App Store’ here we can find packages to download and install on our NAS to improve functionality, these are categorised into Backup, Multimedia, Business, Security and Utilities. We can also see which apps we have installed and make sure we are running the most up-to-date packages. This allows full control of just what is available on the NAS without bloating the initial install. Looking next to the Control Panel, we have a large array of options available from user admin, firewalls, IP blocks, Traffic Control and a whole lot more. All aspects of the NAS and the way it functions are user configurable, though novice users will find that very few of the options need tweaking out of the box. Control Panel also gives us access to a feature which allows us to update our DiskStation to the latest OS version. The latest software can also be downloaded manually from the Synology website. One of the key apps within DiskStation Manager is File Station. This is a file browser and allows us to trawl our NAS at a directory level. It also allows the user to access the files on another device to easily upload them to the NAS. As well as the usual file control abilities rename, delete, cut/copy/paste we can compress files into .zip archives directly on the NAS and create share file links that allow users who don’t have credentials for the DiskStation to download the file. Elsewhere Audio Station allows management of the music library stored on the DiskStation and like VideoStation and PhotoStation allows us to view our content on other devices such as TVs, phones and tablets (or give external access to items such as our photos to family members). Looking more to the business side of things we have full anti-virus and backup support to protect critical data as well as VPN server, FTP, email server and Surveillance Station. Through the optional IP cameras we have up to 40 connections available (with 2 licences bundled). Framerates range from 200FPS @2591×1944 up to 1200FPS (yes, 1200) @ 720p in H.264. Synology also have a full suite of mobile apps available for iOS, Android and Windows Phone too. These include media players for streaming audio and video content as well as mobile versions of File Station and DSFinder. 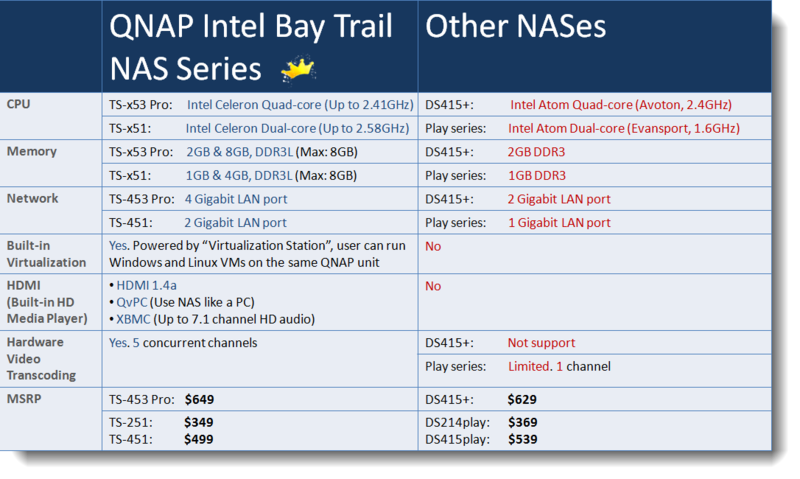 Starting with the build quality and design of the DS415+ we have a NAS which impresses. It may have a chassis which is plastic but the finish on that plastic, both matt and gloss, looks and feels good. It is also strongly constructed thanks to the metal frame inside and should take any accidental knocks and bashes with ease. The LED layout on the front makes sense and is easy to check from a distance and we like the minimal branding present which allows the device to blend in. If we were to change one aspect of the front, sides, base or top it would be to make that front port USB 3.0 spec. Essentially we would love to quickly and easily plug in a fast drive without having to fiddle about round the back of the system. Speaking of the back, no issues there. Plenty of USB 3.0 connectivity, eSATA and Dual GB LAN. That should cope with most users needs within the target market. While that market is enthusiast and small/medium businesses the installation is novice level. Simply slide out the drive tray, screw in your drives and slide it back in. It is that simple. So from unboxing the unit (where we find that it is extremely well protected) to having the system installed and powered up, that should take no more than 10mins. Another 10minutes to install the OS and we are up and running. In terms of overall operating system use we had no issues with the DS415+. DSM is designed to run fine on much older, lower end hardware than the Atom/2GB combination found in the 415+ so it breezes through daily use, regardless of the task. In terms of drive performance that will vary depending on what you have installed but expect normal use to be over 100MB/s for a standard 1 drive configuration and multiple drives peaking over 200MB/s on read/write (including with encryption) Synology have a handy set of performance tables viewable here which go into more in-depth scenarios, such as iSCSI and WebServer times for those who require that information. On the value front the DS415+ is retailing at around £450 currently, which is a competitive price given its features, performance and 2-year warranty. DSM is still the best NAS operating system around and the DS415+ is an excellent hardware solution to run it on. can you compare to TS-451? pricing is lower and it got more features such as 5 video transcoding at the same time, hypervisor etc. HI Alex. Do you mean the Qnap TS-451? If so, will try and get hold of one. Who wrote this review? I have bought the DS415+ and can’t begin to use it. Synology ignores and refuses to assist. They have no manual for it. They have JUST STARTED to do SOME videos but run through it so fast it’s impossible to begin to know what they are talking about and they direct you to do moves without explaining or showing where to access them, so they are useless. Many functions are not covered at all. They are the rudest, most useless group of a company I have ever encountered. Will probably end up having to return it.